This is a beautiful book. It contains an astonishing range of botanical paintings with each plant carefully detailed. The paintings themselves have taken forty-five years to accomplish. Initially Barbara Juppe worked on the project and this was then taken on after her death by her daughter, Leigh Voight. The effort that has gone into this aspect of the book alone is stupendous. There are also lavish numbers of photographs showing some astonishing scenes of the plants in the wild. These pictures were so tempting that it took sometime for me to get beyond them to the text. It will take me a very long time to feel I have done justice to this book since it contains so much information. It is beautifully laid out with clear keys to the species. Each individual species entry contains detailed description, and obvious information such as flowering period. I loved the etymology and also the lists of common names (in several languages). A brief history is given and the conservation status. The maps showing distribution are good although I should have liked them a little clearer; the font size is rather small, but there is information in the paragraph covering distribution, habitat and life cycle to reinforce the maps. The descriptions of just what conditions the plants can be found in are very evocative. “bulbs securely wedged in rock crevices” for example in the discussion of Cyrtanthus epiphyticus, “occurs as scattered individuals on winter-moist, heavy clay flats, in full sun” for Hessea pulcherima. I find it very helpful to be able to imagine the conditions plants grow in naturally. Cultivation is covered very usefully; I expect that this book will lead me to increase the range of plants I grow! 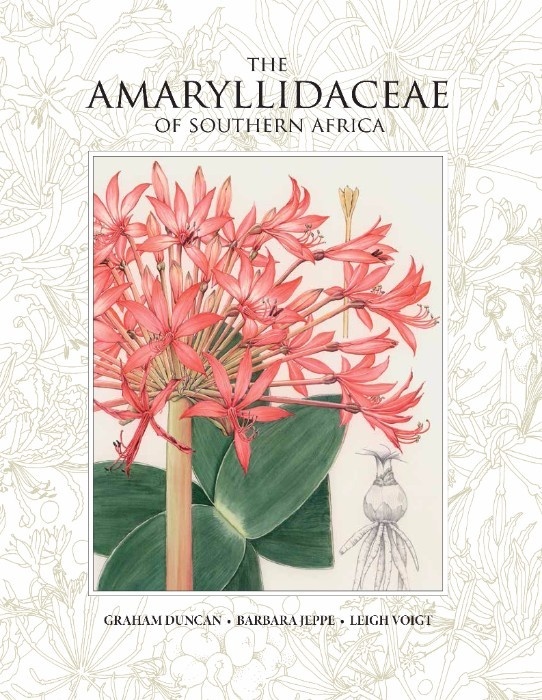 It is an extremely comprehensive book but it does exclude the Allium, Tulbaghia and Agapanthus genera which were previously classified in families other than Amaryllidacaeae. I cannot pretend to be an expert but I am pleased to see that Graham Duncan has treated Nerine alta as a separate species. When we saw them in 2015 in South Africa they looked to my untrained eye distinctly different and deserving of separate status. I was very taken by their delicacy and it seemed a great pity that they were lumped together with other nerines under undulata. It was also a great pleasure to see that the plants we saw in the Cathcart area then classified as Nerine filimentosa (see Amaryllids 2016 part 1 for Dr John David’s observations) have been given their own species name. The pleasure comes from the fact that Graham Duncan has given them the name Nerine macmasteri to recognise Cameron McMaster’s work in monitoring the population over some forty years. There could be no more appropriate name. Pleasure is a word that comes frequently into my mind when thinking of this book. The fascinating range of gethyllis described in the book led me astray for sometime. Indeed, everytime I sit down with the book I am drawn in and move from the plant I initially looked up into reading quite unrelated sections. The paintings are eye-catching and thus lead me into the text, but aside from the individual entries there are sections on things like survival strategies and an index of medicinal uses that have me totally engrossed. In the index of medicinal uses I saw “repairs clay pots”! So of course I had to follow the reference and found that a paste of the Ammocharis coranica bulbs is indeed used to mend clay pots. But further reading tells me that extracts of the bulb which is extremely toxic may have a use in the treatment of Alzheimer’s disease, and root sap of Ammocharis tinneana is used for making a snakebite medicine. Fascinating! And that’s before I got into reading some of the sections on pollination. The book is available in the UK through Kew Publishing priced at £90. This may seem a lot but I can assure you it is not for such a sumptuous book. You should make every effort to get a copy since I am sure you will not regret it. It will long be the book to turn to for this subject, and I am sure that once out of print the price for this beautiful book will sky-rocket.